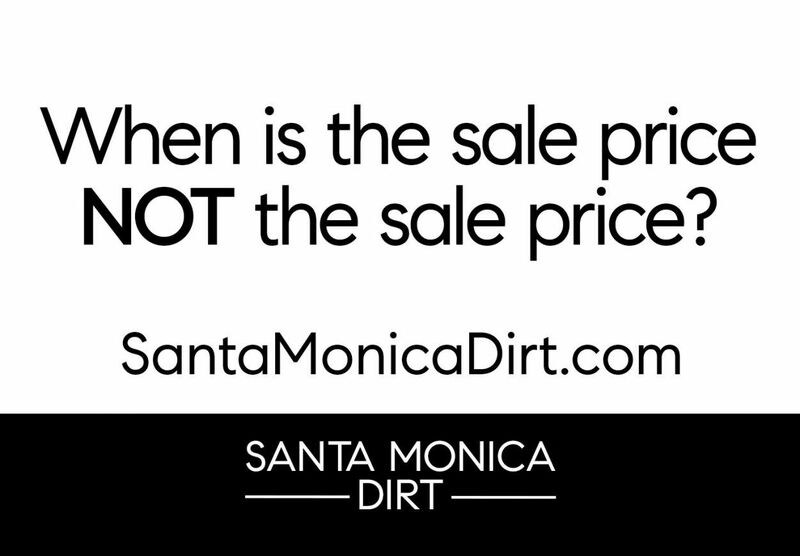 When Is a Sale Price Not The Sale Price? So, a sale that closed last week on 21st Place shows up online, with a somewhat artificially low closed sale price. The Buyer – who happens to be a real estate broker and the Seller agreed that rather than receive a sales commission from the Seller, the Seller reduce the sale price of the home instead. The net result for the Seller is about the same and this is not an uncommon circumstance. But is it legal? Check with your CPA as I am not a tax professional or a lawyer and I don’t give tax or legal advice. That said, over the years I have heard stories of buyers that ask for ideas or methods to record the sale price of their purchases of real property at less than the actual value. There can be various reasons; some divorcing spouse or feuding siblings may not want the ex or the siblings to know what they really paid for a property. Another common reason is that because property taxes are based on sale prices, some Buyers want to keep the base as low as possible, so that the annual property taxes are a little lower. We all know, for the most part, property taxes only go up over time. Occasionally a Buyer will ask the Seller to attribute part of the sale price to some personal property of the Seller’s. The price of the personal property, which I suppose could be furniture, art or maybe even an automobile, is then valued at a mutually agreeable price and carved out of the actual sale price. In the upper-end market where multi-million-dollar properties are being sold, the taxes can be significant. And with the 2018 tax overhaul that limits state and local tax deductions to only $10,000, I imagine more people will be looking for ways to lower their base. Again, check with your CPA and attorney before attempting any tax strategies. 510 Lincoln Blvd – Listed at $5,399,000. 5 bedrooms, 5 baths; approximately 5400 sqft on an oversized 11,000+ sqft lot with pool. Good floor plan and an excellent lot. It was purchased just over a year ago for $5,000,000. 247 20th Street – Listed at $8,295,000. 6 bedrooms, 8 baths; approximately 7,700 sqft on a 60 foot wide lot. Brand new construction on 3-levels. It’s nice to see a variation on the usual floor-plan. Last sold as a lot value in 2015 for $3,275,000. Two have gone into escrow. 607 22nd Street – Listed at $3,450,000 back in September. 2 bedrooms, 1 bath; approximately 1,100 sqft on a 50-foot-wide lot. A “livable lot value” now seems to be firmly in escrow with all contingencies removed. 248 14th Street – Listed for 4,299,000. 4 bedrooms, 4.5 baths; approximately 3400 sqft on a 50 foot wide lot with pool. Pence Hathorn Silver sold this house in 2015 for $3,395,000. 2 closed sales to report. 215 21st Place – Sold for $4,153,500. Originally listed at $4,895,000. 25th Street – I sold this new construction, pre-completion, for over $8,300,000. Are you familiar with Sullivan Canyon? Sullivan Canyon is just north west of Santa Monica, near Mandeville Canyon Road. If you’ve never ventured over there, you might be surprised to find a thriving equestrian community with, stables, a riding ring and miles of riding trails. Much, if not all of the area, was developed by an architect named Cliff May. May got some notoriety for his Post-war California Ranch House-style homes. He eventually retired at one of the homes he built there and lived in for the remainder of his life. Between 1941 and 1977 all residencies at the Old Ranch Road Residential Historic District were constructed in the California Ranch style. Prior to Cliff May’s purchase, the Sullivan Canyon area was owned by Robert C. Gillis, owner of Santa Monica Land and Water Company. Gillis used Sullivan Canyon as his personal retreat. Over time, Gillis sold most of his holdings but chose to keep Sullivan Canyon in the family, where it stayed until they began selling off parcels to Cliff May. May eventually purchased all of it and subdivided it in the 50’s, deriving some of the street names as a combination of May’s daughters, Melany and Hillary. Sullivan Canyon Road was also renamed to Old Ranch Road to pay homage to the area’s rancho heritage. Where am I going with this story? Well, we just listed 1511 Old Oak Road for $7,500,000. Over half an acre of gorgeous, park-like grounds. The California Ranch home is sculpted around an oversized swimming pool, expansive terrace and generous backyard. Designed to take in the serene canyon surroundings each bedroom enjoys its own lovely view and courtyard. Lots of charm- brick fireplaces, vaulted, beamed ceilings & hand-painted mosaic tiles. 3bdrms + 2.5baths in the main house plus an attached 2bdrm + 1bath guest house, 3-car garage and workshop area. Offered for sale for the first time in nearly 50 years! One of very few properties in Brentwood which offers a private corral & 3 stables and is a short gallop to the Sullivan Canyon riding ring!